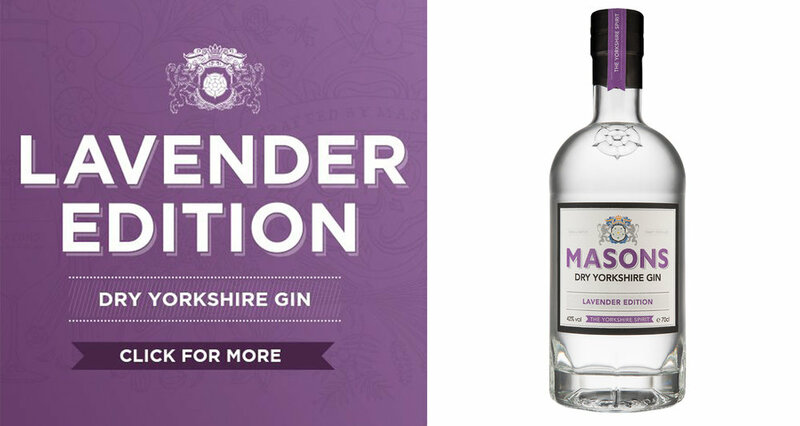 Masons Yorkshire Gin was created by Karl and Cathy Mason, gin enthusiasts with no prior knowledge of the industry who set out to produce a drink that stood out from the crowd – a unique gin with more character and more taste. The first Masons gin was launched on International Gin Day 2013 – and since then Masons Yorkshire Gin has grown phenomenally. The essence of our gin and how we produce it is still the same as when we started out. All our gin is distilled in copper alembic stills (known as “Steve” and ‘Leftie”) in 200 litre batches. We use a traditional slow distillation method, pure Yorkshire water and just the right balance of botanicals to create a distinctive gin that we are proud to call our own. Masons first launched with our Original Gin in 2013. In 2015, we expanded the core range to bring in a Lavender and Tea edition (using Yorkshire Tea of course!). Further “Special Editions” have been added since to complement the range – including Distilled Sloe and Steve’s Apple. Most recently, our Peppered Pear Special Edition was launched at the 2017 Harrogate Christmas Market. Our Lavender Edition is a firm favourite among gin lovers – a wonderfully unique gin that we’re sure you’ll love! Dry lavender notes on the nose and a slight fennel aroma create a soft & subtle experience. There’s a soft texture once upon the palate, with a fresh candied lavender sweet flavour and anise creeping in on the dry finish. How could we resist creating a Tea Edition gin? Quirky yet delicious – don’t knock it till you’ve tried it. Delicate and fresh upon the palate, with a citrus sharpness hitting the senses and fresh aromas that swirl around. Plenty of Yorkshire Tea flavour develops on the palate, as well as fresh aniseed, cardamom & pepper notes before the tea returns for the long finish. The Original is no ordinary gin. Loved by long term fans and new customers alike, this remains our best-selling product. Soft juniper, lime and orange rind flavours lead to a peppery finish with a subtle fennel fragrance on the nose, whilst on the palate there’s a ripe & sweet aniseed start, with bold citrus flavours, plenty of cardamom & green apple blending into a warm, mouth-watering finish.